As debate rages over local police involvement in federal immigration enforcement, new data reveals that Miami-Dade County in Florida leads the South in refusing to cooperate with a controversial federal program to detain undocumented immigrants in local jails. The program involves holding undocumented immigrants in local jails for an additional 48 hours beyond when they would have been released at the request of federal Immigration and Customs Enforcement officials. These written requests are known as ICE detainers or immigration holds. The additional time allows ICE to decide whether to take the arrestees into federal custody for deportation purposes. Detainers have come under fire for compromising the safety of immigrant communities and the public and leading to civil rights violations. As a result, many local jurisdictions like Miami-Dade have decided not to comply with them. According to federal ICE data released to The Texas Tribune, Miami-Dade declined 771 federal detainer requests between January 2014 and September 2015, accounting for the region's largest total by far. The county adopted its policy to decline detainers in December 2013 over concerns that ICE was not fully reimbursing the county for holding individuals as well as humanitarian considerations. 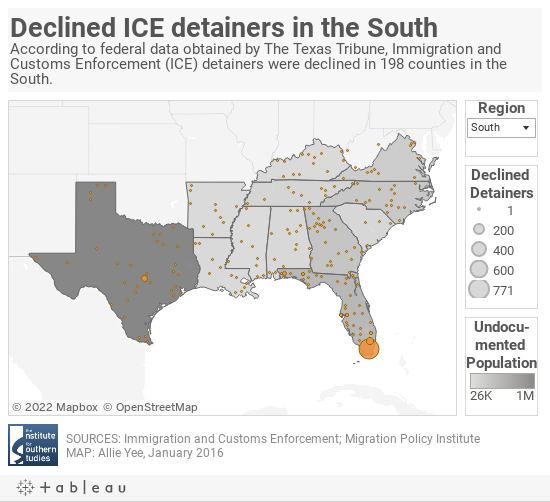 After Miami-Dade, the highest number of declined detainers in the South was in neighboring Broward County, Florida, with 101, followed by Travis County, Texas, home to Austin, with 72. Beyond these counties, Southern jails declined relatively few detainer requests. Nationally, about 18,600 federal detainers were declined in the 21-month period, with nearly 60 percent of those in California. By comparison, only 1,500 federal detainers were declined across 13 Southern states. Efforts to decline detainers have come under fierce attack since the killing of a San Francisco woman last summer by an undocumented immigrant who was the target of a federal detainer but was released by local officials in accordance with the city's policy to limit cooperation with ICE. Congressional, state and local politicians from the South lashed out at these policies, sometimes referred to as "sanctuary" policies or as "community trust" policies by immigrant advocates. North Carolina went as far as passing legislation to ban local community trust laws across the state, and legislatures in Texas and Florida are considering similar bans. Despite the uproar, ICE's data suggests that few jurisdictions in the region are declining detainer requests. Of 198 Southern counties on the list released to The Texas Tribune, only 10 were identified by ICE as having policies limiting cooperation with the agency. Of those, most were in Florida, one was in Texas and none were in North Carolina. 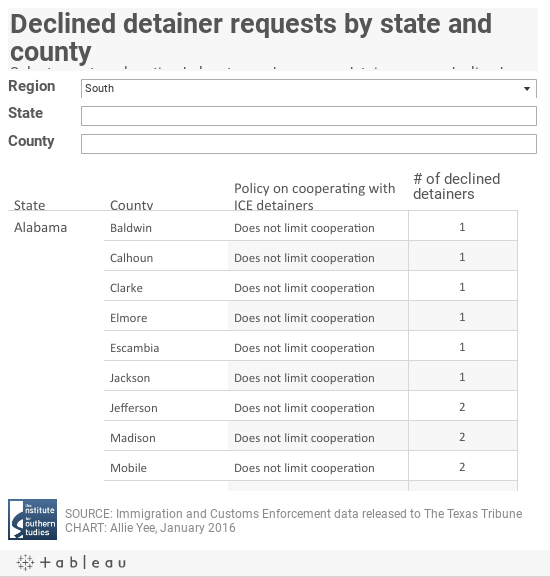 A few other jurisdictions not listed as having community trust policies also had a significant number of declined detainers, including Travis County, Texas. According to The Texas Tribune, local agencies in that state noted that ICE's tallies for non-complying local jurisdictions could also include cases that weren't intentionally declined. Local officials said those totals could include cases where the individual was transferred to another jurisdiction or released after federal officials failed to arrive in the 48-hour window. One federal official told the Tribune that low numbers of declined detainers in some jurisdictions could reflect minor administrative errors at the local or federal level and not necessarily a lack of cooperation with ICE.